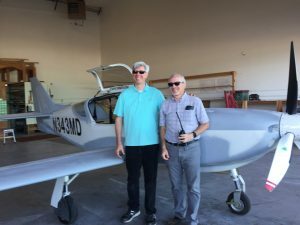 Alan Negrin took my new Glasair Super II RG with our brand new fuel injected 200hp Lycoming IO-360 engine and broke it in with such attention to the right balance of aggressive focus on seating the piston rings perfectly and caution that I now have a beautifully performing aircraft. I’ve flown it 20 hours following his 40-hour test flight and have not had to add a drop of oil. And this was not a normal build for a new aircraft. Alan was climbing into the cockpit of an aircraft with some unorthodox modifications, the most sensitive of which was a completely new design for ailerons never put on a Glasair before. It is only because of Alan’s deep experience and talent as a test-pilot that he took on this risk and knew how to approach both breaking in an engine and feeling out ailerons never tested before. And this was not the only modification. His combination of aggressiveness and cautiousness together with deep experience, recommendations from others, gave me the confidence to choose him over other candidates and I have FAA certification to thank for it. Fortunate for Alan, we had only one issue, and it is here where a test pilot earns his lunch – not to speak of reputation. He suffered a flat nose wheel tire on landing. With a prop just above minimums, 8” total from the runway with normal gear, Alan brought the aircraft under control to a full and uneventful stop, got it repaired and the aircraft returned the same evening. That’s professionalism. The ailerons by the way turned out better than our wildest dreams and dispelled all fears – so far. We were looking for higher roll rates, but we also achieved a lighter aileron and an aileron that performs similar to having spades on them. We lucked out. It could have been that the ailerons grabbed, were uneven, or, because we added back the cusp that the manufacture removed specifically to lighten up the control, would then be very heavy at high speeds. These are all unknowns that Alan had to face with an engine to break in at the same time. That’s a test pilot. Thanks Mr. Negrin.